But industry attention is also focused on whether merchants have installed updated payment terminals that can accept the new cards. Square introduced this contactless reader for $49 in June for use with chip cards as well as NFC smartphones like the Apple iPhone with Apple Pay. U.S. banks are steadily shipping more secure chip-embedded credit and debit cards to consumers, but industry attention is also focused on whether merchants have installed updated payment terminals to accept the new cards. Big retailers like WalMart have spent the last year installing expensive in-store payment terminals that will accept the cards. In many cases, the terminals will also work with NFC-ready smartphones like the latest iPhones equipped with Apple Pay. Yet only about half of the 12 million payment terminals nationwide are expected to be converted to support chip cards or be NFC-ready smartphones by year's end. Small and medium-sized businesses are expected to come on board eventually, but have delayed doing the updates because they prefer cheaper alternatives to spending thousands of dollars for each newly installed payment terminal. Those alternatives come in the form of small, portable hardware that often connects via Bluetooth to a tablet or larger display. In June, for example, Square unveiled a small wireless device that will read a tablet or smartphone using Apple Pay or another NFC-ready payment system, as well as the new chip cards. 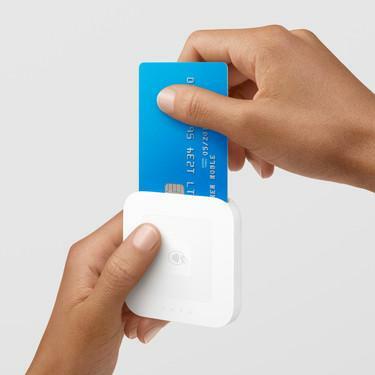 The device is simply called the Square Contactless and Chip Reader and Square is offering 250,000 of the devices for free, or $49 on pre-order. A sign-up page is available on Square's website, and the company expects to ship them this fall. PayPal plans to ship technology in the U.S. in October similar to what it has already introduced in the United Kingdom and Australia. Called PayPal Here, it will also read a chip card inserted into a slot or read the card (or a smartphone with NFC) wirelessly when held close by. Unlike the Square device, PayPal Here also has a slot to accept a traditional magnetic swipe from a card and includes a numerical pad that can be used to accept a PIN for added security from a customer. PayPal hasn't finalized pricing, but expects each Here device will cost a merchant $100 to $150, according to Brad Brodigan, vice president of retail for PayPal. PayPal created a website describing the device, but doesn't yet provide a way to order it. "A lot of small- or medium-sized merchants are on the sideline" about installing point-of-sale equipment to support chip cards or smartphones with NFC, Brodigan said in an interview. "They are trying to understand the cost for the hardware and software to make the change and most see it as an investment or cost." Jordan McKee, an analyst at 451 Research, said that the new devices from Square, PayPal and others are meant to be more cost-effective than traditional point-of-sale terminals that are usually affixed to a countertop. These higher-priced versions can cost $600 to $2,000 each and are made by dozens of vendors with names like HP and Logic Controls. "These cost-effective solutions provide small merchants a quick and easy onramp to accepting new payment technologies such as Apple Pay and chip cards," he said. "I see dual-interface [chip and NFC-ready] solutions as playing a signature role in building out acceptance amongst small merchants who are widely anticipated to be late adopters." Visa, MasterCard and other companies that provide credit card networks for banks have been pushing for updated chip card technology for greater security. About 3.4 billion chip cards are widely distributed in 80 countries outside the U.S., according to the EMV Connection website. EMV stands for Europay, MasterCard and Visa, the original companies that developed the chip cards. The Payment Security Task Force, an industry group comprising banks, retailers and point-of-sale device makers, has predicted at least 47% of U.S. merchant terminals will support chip cards by the end of 2015. Banks and card issuers have set Oct. 1 as the date when card counterfeit fraud liability will shift from banks to merchants, or the party using the least secure technology. Brodigan said retailers face a risk of liability without upgrading their terminals, but he argued that they also can earn a reward for doing so. With upgraded terminals that support smartphones on NFC, retailers can set up loyalty and rewards programs with customers that could yield better sales and profits. Brodigan said merchants of all sizes in the U.S. still face confusion about whether customers must produce a chip card to be read by the terminal and also provide a signature or type in a PIN to complete a transaction. With NFC smartphones, there is usually no need for either a PIN or a signature. The decision on using either a PIN or signature will rest with banks, though some have yet to commit to one approach or the other. Brodigan argued that it's consumers who will determine whether they favor a signature or a PIN. "Unfortunately, the jury is still out," he said. "Our position is that we want to help merchants support both PIN and signature, but some card readers only support chip and signature." Square's new reader, meanwhile, connects wirelessly to a smartphone, tablet or a Square Stand device where a customer's signature is taken and not, apparently, a PIN. "The U.S. is a chip and signature market," a Square spokesman declared in an email. Chip and PIN is the standard for chip card purchases made in Canada, Europe and Australia.